I will not be among the first runners to finish. No, I won’t even be close. Many will cross the finish line before I reach the halfway mark. But that’s OK. There is only one runner I compete with. Me. Like most runners, I compete for personal records, also know as PR’s. As I get older PR’s get harder to attain. My last one was at the “Crim Festival of Races” in Flint, Michigan in 2015. I ran the 10 mile race in 1 hour, 39 minutes, and 35 seconds. A 9:59 per-mile pace, it was not one of my better times. It’s only a personal record because my one previous 10 mile race (the Crim in 2013) was really bad. I finished that one in 1 hour, 51 minutes, and 20 seconds. than twice the distance of a 10K, at a faster average pace. I set my 10K PR at the “Heart of Detroit” in downtown Detroit in 2011. It was a hot, humid August morning. I struggled with the elements, but still managed to PR and finish 4th out of 19 in my age group. Nevertheless, I’ve since thought I could do better, despite several subsequent failures to beat my 2011 time. My Chicago Marathon training plan calls for a 10K race tomorrow. I will be back in downtown Detroit to run the “Escape to Belle Isle.” The weather forecast is predicting a warm but tolerable 66 degrees at race time. 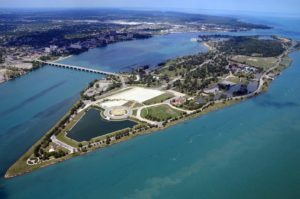 Belle Isle is a flat course. My training has been going well. It looks to be a good day to try for a PR. I’ll let you know how it goes. Click here to help me and Team World Vision provide clean water to families in Africa. Just $50 provides clean water for one person for life! Always inspiring, John. Thank you for your blogs and inspiration. PRs are always a challenge, probably the best for runners like us.